The Institute of Digital Healthcare is a partnership between the NHS, Warwick Manufacturing Group and Warwick Medical School, aiming to improve people’s health and wellbeing through the development, evaluation and use of innovative digital technologies and services. The Institute’s objective is to improve the quality, safety, accessibility and productivity of healthcare by supporting the implementation of digital solutions for the public, patients and professionals, underpinned by rigorous, multi-disciplinary academic research and a translational perspective in delivery. 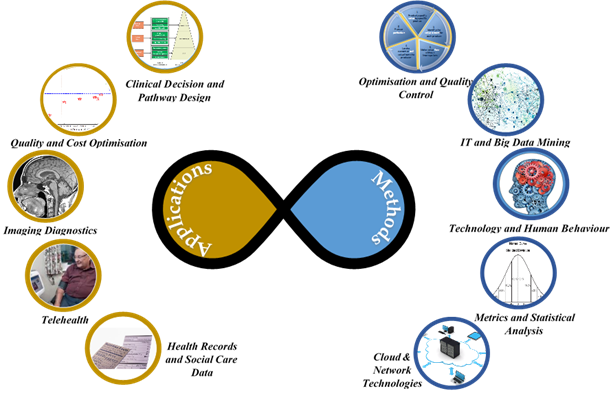 Its model of research-led innovation in healthcare entails identifying real problems, understanding them by identifying relevant theories, selecting appropriate technologies and developing new solutions where necessary. Each solution undergoes rigorous evaluation for safety, effectiveness and cost implications before its diffusion and implementation to the healthcare domain. IDH is working with industry, the NHS and across many disciplinary boundaries. The Institute employs experts in biomedical and information engineering, health psychologists, statisticians and clinicians with public health, hospital medicine and community health backgrounds. Some have spent several years working in the NHS, while others have extensive industry and academic experience. This means that the IDH can understand and analyse most health-related problems, and consequently develop, evaluate and deploy innovative digital healthcare solutions. What challenges is IDH addressing?